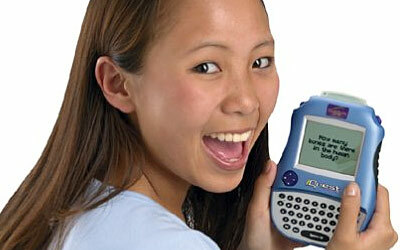 Interactive talking handheld that makes studying for tests fun, fast and effective. Covering over 170,000 questions based on more than 260 real textbooks, the iQuest helps you study what you need to know for your tests. Plus, it's your personal organizer complete with dictionary, address book, calculator, calendar and more. Curriculum: 5th - 8th Grade Math, Science and Social Studies, standardized test preparation. The iQuest handheld provides a customized learning experience that revolutionizes the way students study for tests and quizzes--by making the process fun, fast, and effective. iQuest is the hip handheld that prepares students for tests in math, science, and social studies with study questions based on their textbooks. Small enough to fit in the front of a backpack, the iQuest also keeps students organized with a scheduler, address book, dictionary, and calculator. Use the Mind Station connector to download textbook chapter outlines and audio quiz questions onto a cartridge. Then insert that cartridge into the iQuest to learn chapter materials through two game modes: Pop Quiz, the fun beat-the-clock mode, and Chapter Challenge, a thorough review of textbook material. iQuest comes with instructions, a 4 MB reusable cartridge with 1,000 questions, and a snap-on cover/faceplate. Four AA batteries are required but not included.